Under the guidance of Sh. Vijay Saluja, Giraffe Heroes India’s new Director, Giraffe Heroes India (GH/India) aims to bring Giraffe vision, strategies and tools for change to the 1.3 billion people on the Indian subcontinent – making it potentially by far the largest Giraffe global affiliate launched to date. GH/India will tell the inspiring stories of the country’s heroes, motivating others to become heroic too. GH/India will also offer practical tools citizen activists need to succeed, as well as Giraffe civic engagement programs in schools, helping young people build lives as courageous and compassionate citizens serving a vibrant India. Dwarka Parichay being media partner for the Giraffe Heroes India program, starting a series of inspiring stories of heroes in India. This will definitely motivate others and more Giraffe Heroes will join the GH/India brigade. Check for criteria & nomination form for a Giraffe Hero India. According to a UNICEF report, 25% of girls in India die by the age of 15 from neglect or even infanticide. Too many families value only sons. 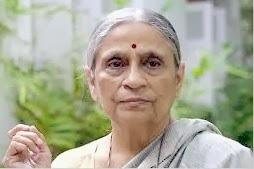 Ela Bhatt is working to change all that by using Gandhian principles to help girls and women become more independent and empowered, financially and psychologically. Bhatt was raised at the end of the freedom movement; her grandfather joined Gandhi on the great Salt March in 1930 to protest the British ban on Indians making salt. She believes the Gandhian principles of non-violence and economic empowerment can uplift India’s poorest women and contribute to social and political changes for the whole country. “Gandhi said that women are natural leaders in our fight for social justice where love and peace, nonviolence, are the chief weapons of the fight,” says Bhatt. It all started in 1972 when Bhatt was a young lawyer working for a textile union in Gujarati. A group of women workers carrying loads of cloth on their heads claimed merchants were cheating them. Illiterate, the women could not check the weights and measures of their loads. Bhatt helped organize the women for a strike, and that was the beginning of the Self Employed Women’s Association (SEWA). SEWA organized women’s trade unions and cooperatives in which women could pool resources and stand together against social, political and economic injustice. SEWA started a bank to give loans to women, and soon began educating women about saving, offering training programs, providing maternity leave for Co-op members and education for their children. Standing up for women’s rights and dignity, and standing against police abuse, out-dated politics and cultural discrimination against women, SEWA grew to become India’s most powerful women’s trade union. Shanta Samal from Gugarat is just one woman who has benefited from being a member of SEWA. Samal does traditionally women’s work: rolling tobacco into a leaf, creating a “bidi” or cigarette, which she sells on the streets of nearby Ahmedabad. Before SEWA came into Samal’s neighborhood, a bidi roller earned about 10 cents for 1,000 cigarettes. But now, they earn 70 cents. And now, when women like Samal are pregnant, they can receive grant money allowing them to take maternity leave. There’s even a scholarship fund for their children’s education. Co-op members are taking charge of their own lives and the lives of their families by pooling savings to buy communal equipment or to open village stores.